I'm raising a couple of awesome hikers. James is just 6 and Michelle is not yet 4 but when we hit the trails we go whole hog. They don't tire, they don't back down and they actually prefer to lead. The official trails at Pinery aren't intense enough, so we tack on the sand dunes that snake their way along the lake. I find these adventures gruelling but the kids don't complain. In fact, they beg for more. Looking back, I should have seen this coming. In 2005 I took James, who was then just three years old, camping at Killarney Provincial Park. Killarney has some fierce trails through rocky terrain and James took them on like a pro. Compared to Killarney's trails, the trails and sand dunes at Pinery are child's play. 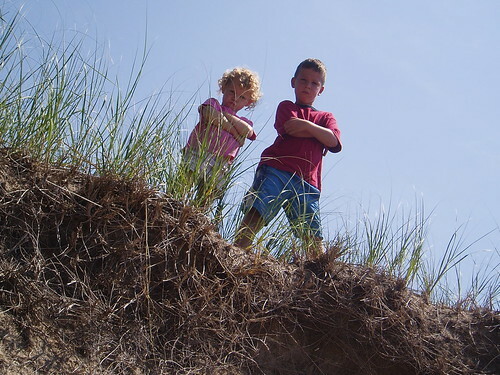 Here are my pint-sized heroes striking a menacing pose. Be afraid. Be very afraid. Thanks, dude. I just watched that Rush on Colbert thing on your blog.